December 11, 2018 – The U.S. Air Force’s first Lockheed Martin-built GPS III satellite is now encapsulated for its planned December 18 launch from Cape Canaveral Air Force Station, Florida, on a SpaceX Falcon 9 rocket. 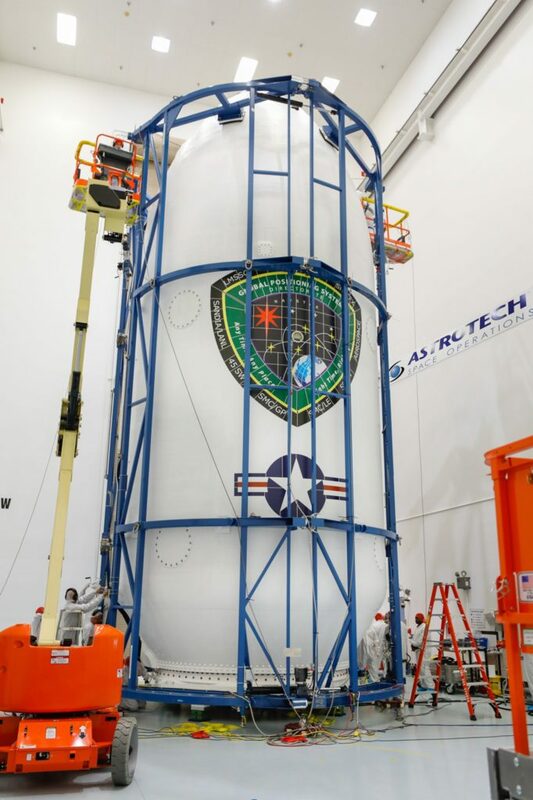 GPS III Space Vehicle 01 (GPS III SV01) underwent pre-launch processing, fueling and encapsulation at Astrotech Space Operations, in Titusville, Florida. During encapsulation, GPS III SV01 was sealed in its launch fairing, an aerodynamic, nose-cone shell that protects the satellite during launch. In the coming days, the fairing-enclosed satellite will be mounted to the rocket as launch preparations continue. GPS III SV01 is the first of an entirely new design of GPS satellite which will help the Air Force modernize today’s GPS constellation with new technology and advanced capabilities. GPS III has three times better accuracy and up to eight times improved anti-jamming capabilities. Spacecraft life will extend to 15 years, 25 percent longer than any of the GPS satellites on-orbit today. GPS III’s new L1C civil signal also will make it the first GPS satellite broadcasting a compatible signal with other international global navigation satellite systems, like Galileo, improving connectivity for civilian users. Lockheed Martin developed GPS III and manufactured GPS III SV01 at its advanced $128-million GPS III Processing Facility near Denver. In September 2017, the Air Force declared the satellite “Available for Launch” (AFL) and had the company place it into storage. Last Summer the Air Force “called up” the satellite for launch and Lockheed Martin delivered it to Florida on August 20. The Air Force nicknamed the satellite “Vespucci” after Italian explorer Amerigo Vespucci. In September, the Air Force selected Lockheed Martin for the GPS III Follow On (GPS IIIF) program, an estimated $7.2 billion opportunity to build up to 22 additional GPS IIIF satellites with additional capabilities. GPS IIIF builds off Lockheed Martin’s existing modular GPS III, which was designed to evolve with new technology and changing mission needs. On September 26, the Air Force awarded Lockheed Martin a $1.4 billion contract for support to start up the program and to contract the 11th and 12th GPS III satellite.